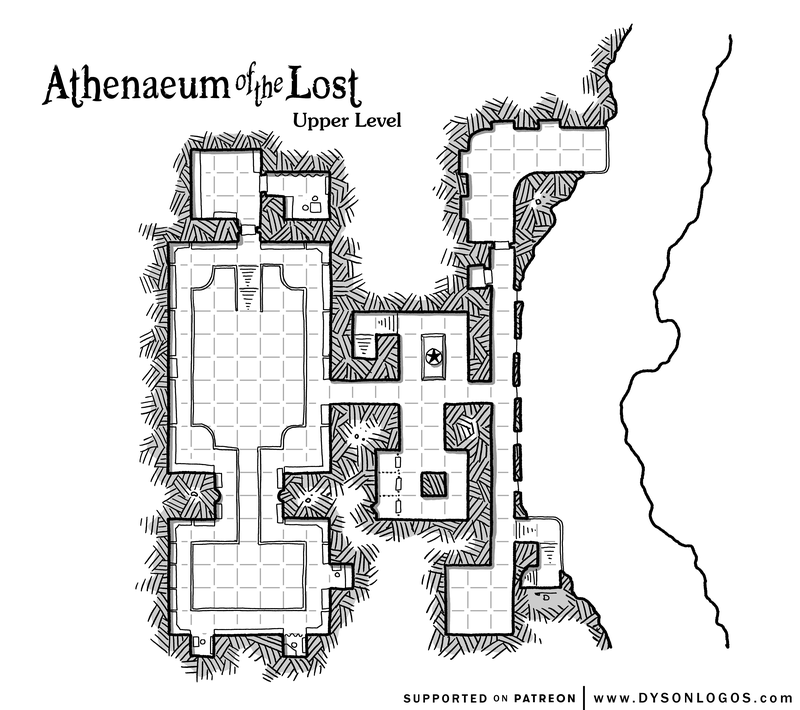 Connected to the lower level via three different staircases, the upper level of the Athenaeum of the Lost contains fewer books than the ground level, but has a number of interesting locations. One of the first things noticeable about the Athenaeum when approaching it from the broken bridge on the main level is the upper galleries and open staircase leading there. Above the main entrance is a long gallery along the wall of the underground crevasse with five windows looking down over the bridge. At one end of this gallery is a twisting staircase that leads between the levels, fully exposed and open to the crevasse for a portion of the climb. At the other end is a larger gallery and lookout. This level of the library is a mezzanine looking over the main library with floor to ceiling bookshelves set along the walls as well as a number of reading spaces and a small locked archive where the scholar-priest keeps those volumes he is intent on repairing or copying. The level also includes a small set of cells for people caught sneaking around the area, and a small open chapel with a statue of the god of knowledge and secrets. Nice map, but where did you get the weird dice? They look Awesome. That’s a d4 and a d7 from Impact Miniatures.